I'd recommend you get this 4 qt. 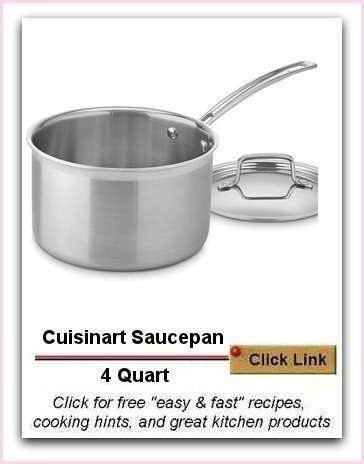 Cuisinart saucepan if you are to obtain just one piece of quality cooking equipment. The size is perfect for most cooking needs. Every novice cook must have at least one quality saucepan and if you are to choose just one, I'd suggest a 4 quart saucepan which is an item more than likely to be used most frequently. It must be made of thick stainless steel for durability and even cooking and must have a firm secure handle. No plastic on the pot anywhere, please! Saucepans by Cuisinart deliver these properties being constructed from premium grade three ply steel. The thick base means heat is distributed evenly for even cooking results and notice the handle is firmly riveted and is of a thick gauge for firm secure handling. Even though you may be cooking for one, cook double or triple the quantities to put aside surplus to freeze. If there is ever a saucepan that is used frequently, it will be a 3 or 4 quart saucepan. Tight-fitting cover seals in moisture and nutrients for healthier, more flavorsome results.